The recent threat by the dreaded Harkat-ul-Jihad-al-Islami (HuJI) to bomb the Pakistan embassy in New Delhi is a pointer that this outfit is becoming more brazen and wants to focus most of its activities in India. With the Lashkar-e-Tayiba taking a back seat where India operations are concerned for the time being, it looks like this dreaded outfit HuJI which operates primarily out of Bangladesh is planning on taking centre stage. Sources in the Intelligence Bureau say that HuJI has always been looking to dominate in India. The original plan by the ISI was to keep India on tenter hooks from both sides ie Pakistan and Bangladesh. While the Pakistan border was to be controlled by cadres of the Lashkar, the border along Bangladesh was always considered to be the domain of the HuJI. A dossier prepared by the Indian Intelligence Bureau goes on to show that there has been an increased amount of activity where HuJI is concerned. The recruitment is at an all time high and records would show that at least 150 youth from West Bengal have gone missing. Investigations have gone on to show that these youth were picked up by the cadres of HuJI and are being trained to launch operations against India. However an interesting point that Intelligence agencies make is that the kind of terror that HuJI is looking to launch would be different in nature. They are looking for abductions of high profile individuals so that they can hold the state to ransom. HuJI is known to specialize in this field and they would using their knowledge in this regard on the Indian soil as well. This would solve two issues for this terrorist outfit. One they would try and raise money through such abductions and secondly they will ensure that the state is held to a ransom through such activity. The growing ties between India and Bangladesh have put the brakes on this outfit and both countries have agreed to jointly counter the menace of this outfit. HuJI relied on the counterfeit notes racket to a large extent like all other terror outfits. However with the relations with two countries growing stronger the brakes have been applied on raising money to a large extent. The IB says that HuJI would surely try and focus on carrying out terror attacks. However first on their agenda would be to try and raise funds for such attacks. They have been offering lucrative packages to their cadres. They have decided to go about their India operations in a systematic manner. First and foremost they would raise funds through abductions and later use the same funds to carry out terror strikes. They have even started to offer their cadres attractive packages and the families of the suicide bombers are being offered anything between Rs 20 and Rs 25 lakh, the IB says. The strongest base for the HuJI in India had always been Hyderabad and this was set up by Shahid Bilal who was two years back killed in an encounter at Pakistan. The fall of Bilal and the police action in Hyderabad had put this outfit completely on the back foot. However today they are trying to make a come back and using all of their resources to ensure that they do successfully. They have appointed cadres mostly from West Bengal to set up sleeper cells and each one is being offered Rs 10,000 per month. All this information that has been picked up based on intercepts by the IB also suggest that these sleeper cells would be set up first in the Nothern part of India before they move down South. There are already two control centres that have been set up in Bangladesh exclusively to monitor the operations in India. These centres have been set up to train the youth who have been picked up from India and once their training is complete they are sent back to carry on with their work. Following a Home Ministry alert regarding these developments, security agencies have already started to monitor the youth who have returned to India from Bangladesh. The alert is high the IB says and all police stations from across the country have been alerted regarding these developments. Security agencies also warn that action needs to be taken swiftly. If one looks at the manner in which the HuJI is going about its work, it becomes clear that the outfit means business and is going out of its way to strengthen its base in India which it had lost 3 years ago. Groups such as the Lashkar-e-Tayiba and its affiliates always posed and will continue to pose a security risk for India unless their mentors Pakistan act very seriously against them. Security experts are of the view that while the threat perception from the Pakistan border continues to be huge, there is growing activity on the Bangladesh border which needs to be taken seriously failing which the troubles for India will only grow. When one speaks about Bangladesh, the first thought that comes to mind is that of the HuJI which has been dominant for some time now and has managed to spread its tentacles into West Bengal and the Hyderabad region courtesey the late Shahid Bilal. However now there is an added head ache and this comes in the form of the Jamaat-ul-Mujahideen. The JMB as it is known as was never much of a problem for India since the group focused largely on Bangladesh and followed the ideology that no civilians should be attacked and their war was only against the government. While this outfit was growing in strength during the early part of 2000, there was a decimation of its cadres when the government of Bangladesh cracked down on it and arrested nearly 95 of its cadres. In the later part of 2008 this group was down, but now according to Intelligence reports they have started to re-group and the worrying factor is that they are being backed by the Lashkar-e-Tayiba in this exercise of theirs. The Lashkar realises the importance of having a very important ally in Bangladesh so that attacks could be launched on India from that border. Although the HuJI is an ally and will continue to be, the ISI/Lashkar feel that they have been too much on the radar and it may be difficult for them to carry out an operation with ease. They would want the HuJI to remain functional, but would prefer if it focuses more on the North Eastern states where enough and more seperatist movements are looking for external help. The JMB gains importance in the wake of the Lashkar sending in its Bangladesh based cadres into India in the recent past. Security agencies say that there has been a clear change in plan and they will look to push in more through the Bangladesh border and this also would mean that the members of the JMB are playing a crucial role in this. The Intelligence Bureau says that the JMB has already started to operate on Indian soil. For starters they have taken control of the Hundi operations which is a major fund grosser. They have their sympathisers in the Gulf and raising funds has not been much of a problem for them. In addition to this a few recent arrests of its members on the Indo-Bangladesh border have revealed that they have been pumping in fake currency and the Intelligence agencies see this as a first step towards them building up a network in India. The first signs of this group being interested in operations in India came during the hijacking of the Indian airlines flight to Khandahar. While the Indian agencies have not been able to establish a direct link between the JMB and the incident, the interrogation of a man by the name Belal Hosain who was a key member of the group revealed that he was aware of this plot. The CBI had only managed to establish that the entire operation was planned on Bangladesh soil but no member of the JMB was involved in this plot. However the more important thing about that interrogation was that he told the CBI that the JMB was constantly trying to regroup and had even planned a series of attack on Indian soil. He had also told his interrogators his group was very upset with the joint offensive by the Bangladesh government which was supported by India against them. The IB says that this outfit which was formed by Sheikh Abdur Rehman in 1998. The group was formed after Rehman who was originally with the HuJI fell out with the group. While the divide had remained for a long time, it is now the Lashkar which has stepped in to take advantage of this group as it thinks it is ready to launch full fledged operations once again. What are these terrorists planning? Four terrorists are on the loose in Mumbai city according to the police and the sketch of one was even released by the police on Thursday. As the police continue to chase these terrorists with the help of the intelligence bureau who are passing on inputs, it has become clear that these men have slipped in from Bangladesh via West Bengal. On these persons arriving at Mumbai, an alert was sounded off and it was also said that these men were planning on carrying out strikes at high profile places which also included the police headquarters. Prior to the alert being sounded off against these four men, there was another alert three days back in which it was said terrorists may try and target Mumbai and Ahmedabad. Interestingly the Mumbai police had a similar task on hand ahead of the Ganesh festival celebrations. At that time the intercept was that two terrorists had entered into the city and planned on carrying out attacks in the city. The two men Kalimuddin Khan alias Rameshwar Pundit and Hafiz Sareef had come into the city in the month of September and had planned on disrupting the festival. However till date these men have not been apprehended as yet. The pattern looks interesting and according to intelligence bureau officials, such things would continue to happen and it could be seen more in Mumbai. The first thing that one notices is that the Lashkar-e-Tayiba is sending in a lot of its cadres from Bangladesh into Mumbai when compared to the Pakistan cadres who were a regular in this city earlier. The second thing is that these men actually do not go ahead with the attack and vanish all of a sudden without leaving a trail. The IB explains to rediff.com that in future Mumbai will see more and more men of the Lashkar from the Bangladesh unit. This is a carefully thought out move since there is more inputs on the Pakistan cadres when compared to their counterparts in Bangladesh. Post 26/11 the borders we share with Pakistan was better manned when compared to the one we have with Bangladesh. Infiltrating through the Bangladesh border is easier since there are not enough checks in West Bengal and this makes it an easier route for terrorists to enter. The second point is that these men are not always sent to carry out attacks. Their job is basically to set up modules and also pass on money to the existing cadres. They do not come in with arms or ammunition in order to avoid the heat. They usually carry on them information and also money that will be passed on to the cadres who are part of the modules in Mumbai. Such cadres who come into the city apart from doing the job of passing on information and money also act as distractions for the security agencies. They normally do this and ensure that a bit of information regarding them is passed on so that they can undertake a different mission without having the heat on them which would be more serious in nature. These men more often just slip into the city and then slip out immediately. They never hang around in the same place, the IB also adds. There has been an exercise over the past couple of months to strengthen their base in the city and this is a continuing exercise. However such things cannot be taken for granted as they do also carry with them an element of surprise and could well strike and hence it becomes absolutely necessary to issue an advisory as we need people to be on alert. The four Lashkar militants who are from Bangladesh have now been identified as Abdul Kareem Moosa, Noor Abu Ilahi, Walid Jinnah and Mahfooz Alam. 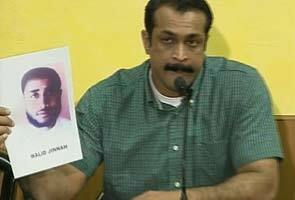 The Mumbai police say that there are very much within the city and one of them could have even changed his appearance. The police are however taking no chances and have even formed a special squad to arrest these men. Apart from this the police have also sought information from the general public regarding these men. Author Vicky NanjappaPosted on December 24, 2010 Categories TerrorismTags Bangladesh, Lashkar-e-Tayiba, terrorism, Vicky Nanjappa8 Comments on What are these terrorists planning?